For the greater part of July, we have been traveling and visiting, and visiting and traveling! Since Baby Hepworth is due on December 8th, we’ll be spending Thanksgiving and Christmas in Tucson. This will be Squire’s last big Summer break during medical school, so we decided to make our free Summer time count with a long Summer trip. Our first leg took us from Tucson, AZ to Palmdale, CA to visit and pick up my Granny Shanks. She treated us to Hometown buffet where we ate to our hearts’ and stomachs’ content. Granny couldn’t believe how big and independent Lincoln has become since she saw him last – or how messy he could manage to get while feeding himself. Day 2 of our travels brought us from Palmdale to Reno – my hometown. On the way, we drove through Bishop, CA, and had to make a special stop at the amazingly delicious Schat’s Bakery for lunch and some goodies. We brought our sandwiches over to the park across the street. There is a nice grassy-banked stream running through the park with lots of ducks. Squire took a few pieces of bread out of the car to feed the ducks with Lincoln. He threw a piece in the water to demonstrate, but every time he passed a piece of bread to Lincoln to throw, Lincoln simply ate the piece of bread instead. Gran and I loved watching the exchange from the picnic bench. 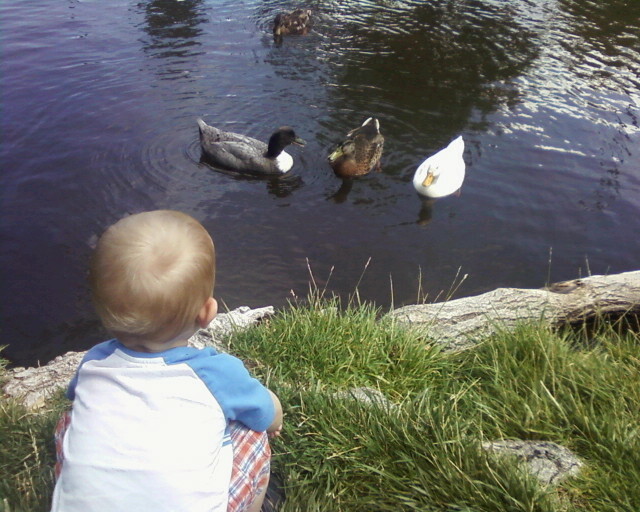 Intently watching the ducks he didn't feed, at the park. While in Reno, Squire and I had a chance to do an Endowment session at the Reno temple with my parents, and my brother, Jeremy and his wife, Heather. It was our first time back inside the Reno temple since we were married there almost 4 years ago. Aunts McKenzie and Riley, and Granny Shanks watched Lincoln and little baby CJ for us while we were inside – for which we were most grateful! After our temple session, we went to Claim Jumper for a famous appetizer/dessert fest. Well, maybe not famous, but certainly worth noting. If you ever get the chance to join us for one of these, let’s just say that you’ll have to grab fast if you plan on eating anything, otherwise you might just be left picking crumbs from the plate. Lincoln couldn’t get enough of the squeaky sound his straw made when he lifted it up and down inside the lid. He was even more entertained by the symphony of straw squeaking when everyone at the table joined him at the same time. Lincoln found his "claim" at Claim Jumper! A secret snapshot of the unsuspecting couple, lacing fingers and chatting. Lincoln had a blast running around with all of my young cousins and cousin’s kids, digging in the dirt, and eating all of the marshmallows, Starbursts, graham crackers, popsicles and other sweet treats all my extended family couldn’t help but feed him. Enjoying his ice cream cone, dirt and all! 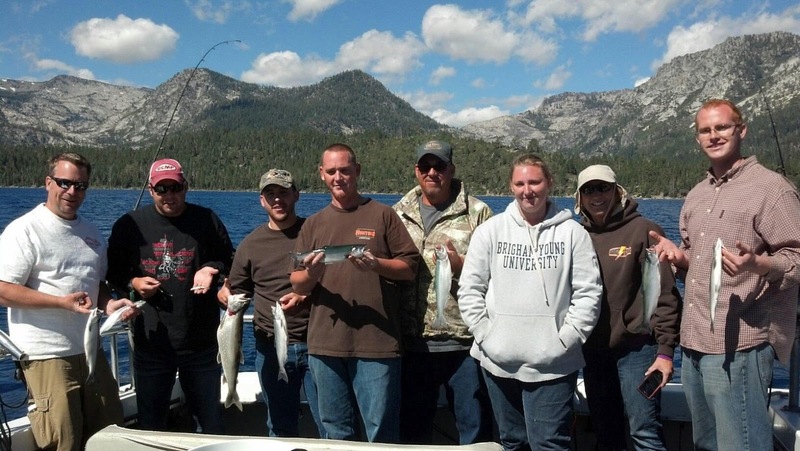 Squire had a great time going out on Lake Tahoe with my Dad, Uncle Frosty, and other cousins and family to catch fish. My cousin Dallas caught the biggest fish, so he earned official chest beating rights for the rest of the weekend. Squire brought in 7 Coconino Salmon – the whole party brought in 50 fish together. My Mom (Mimi) actually getting to hold and snuggle with Lincoln for a solid 20 min. before he went down for his nap (a rarity indeed) after a chilly swim in Fallen Leaf Lake. Squire and I sneaking away on the tandem bike to the quaint little ice cream parlor down the road from our campgrounds and getting “single scoop” ice cream cones that had about a half-gallon of ice cream each. Lincoln sneaking chips, corn on the cob, hot dogs and all sorts of other foods from unsuspecting family members’ plates throughout the week. Going on a hike with my family which started out rough with a very rocky path, (and my frustration at Lincoln insisting on walking through much of the impossible path on his own two tiny feet), but ended up being quite beautiful. Watching Lincoln hold his baby cousin CJ. Being “soft” with her by stroking her little head, and jealously grabbing her back to his chest any time someone tried to take her from his arms. Lincoln loved holding his baby cousin CJ - I'm hoping his tenderness with her is a sign of things to come from him as a big brother to Baby Hepworth. Hearing Granny Shanks tell the story of her life to all her posterity. My brother Jeremy giving CJ her baby blessing in the wooded area of our campsite on Saturday morning. Getting to spend some time with my cousin Carly and her family Saturday night, before her flight left on Sunday afternoon. Playing a glutinous number of games of Monopoly, Risk, and Acquire with my family during the down time. We headed out of Reno a day later that we had originally planned as our car started having troubles about 15 minutes before we arrived in Reno the week before. We brought it in to a shop to be fixed the week we were camping, and couldn’t pick it up until Monday morning. So, on Tuesday we made our way to Page, AZ. On the loneliest highway, we made sure to stop for a quick photo in front of the shoe tree as we had taken one on our Honeymoon. The shoe tree was actually featured in the very first post of this blog! Squire and I in front of the Shoe Tree on Highway 50 - just shy of 4 years after our honeymoon photo was taken. We spent two days in Page. 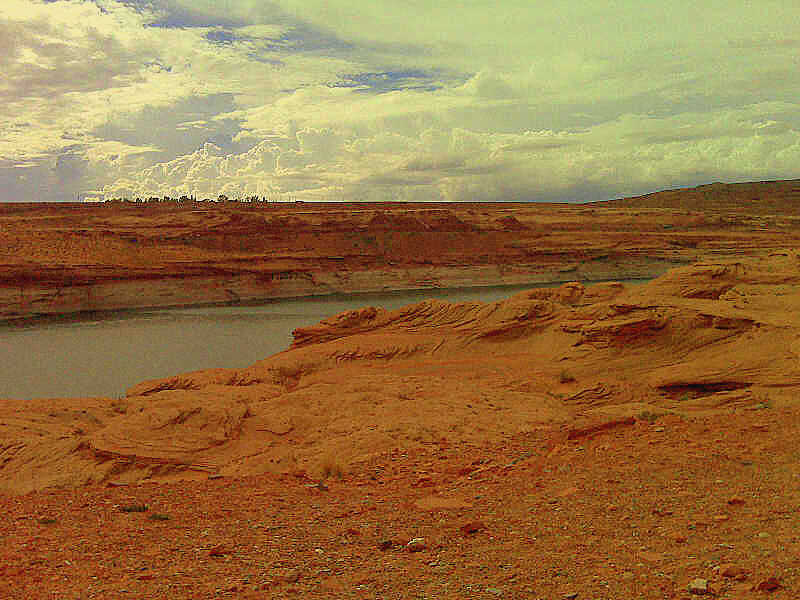 Wednesday we went swimming at the “Chains” on Lake Powell. The next day we went out to Paria. We went out on Trace Lake where Squire proposed to me. Squire wanted to fish a bit. He was in luck as he caught a ginormous at least 3 foot long Bass – and only on his second cast, too! Sorry. No pictures of the fish. You’ll just have to trust my word on this one. Really though, this whole story was almost completely 100% true. ;) I leave it to you to figure out which part(s) are fact and which are fiction. After our short time in Page, we made our way up to Salt Lake City, Utah to see Squire’s cousin Jaymeson get married. We loved getting to see all of Squire’s extended family there at the temple and at the reunion later that evening. Lincoln especially enjoyed playing with Squire’s cousin Blake’s seven year old son, Jaxen. The reception was beautiful and the new couple looked so happy. You can check out some of the pictures from the event at this link if you care to see. The most exciting part of all? Lincoln looked absolutely adorable with his faux-hawk, in his checkered gingham shorts and button-up white church shirt and converse sneakers at the reception . . . until he fell into the pool. Yes, our child fell in to the pool head first - but not to worry! He was pulled out just a moment later by one foot by his dad to the tune of his Great Grandma Tripp screaming in the background of the whole scene. I’m so glad we packed an extra little play outfit for him. 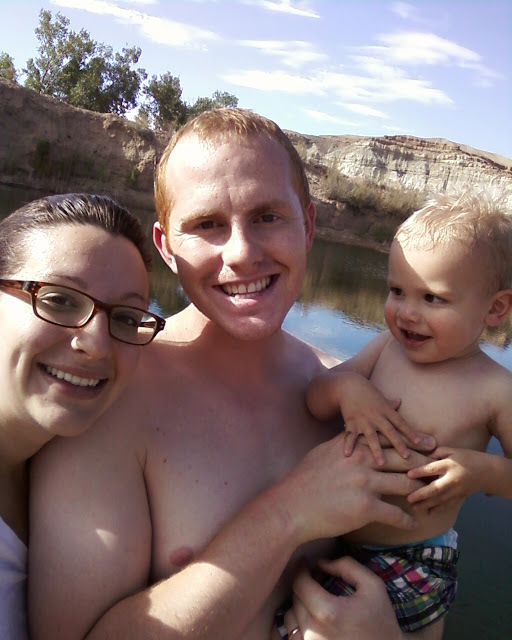 Enjoying a nice long swim in Aunt Blythe and Uncle Kent’s heated pool after Lincoln went to bed for the night. Stopping to visit Squire’s sister-in-law and her son, Dean, for a visit before the reception. Dean and Lincoln enjoyed playing with Dean’s jack-in-the-box together. They look very similar those two little cousins! We made a stop to visit Birch on our way back from Utah, to check to see if it had rained and if there were any problems up there that needed fixing. On our way down the dirt road, Squire kept Lincoln on his lap as he drove. 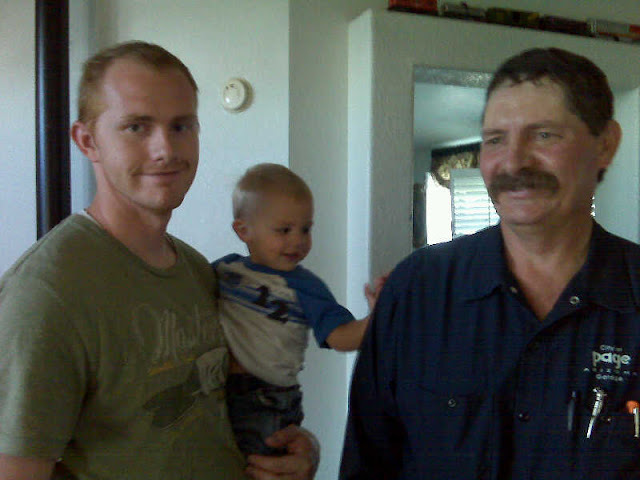 Grandpa Hepworth taught Lincoln to bubble his lips like a car engine as he sat at the steering wheel. Lincoln loved it and did it too. It was adorable. On our drive back from Utah to Page, we also made a stop to visit Great Great Grandma Brinkerhoff in Glendale. With all of the lake swimming we’ve been doing, Lincoln has sort of picked up the habit of throwing things, as he spent a lot of time throwing rocks into each respective lake. Grandma Brinkerhoff remarked, upon seeing Lincoln’s energy and the way he would throw Lincoln Log pieces across her living room (despite our admonishing him to the contrary), that, “I don’t think I’d feel very safe alone with him!” Oh, Lincoln. 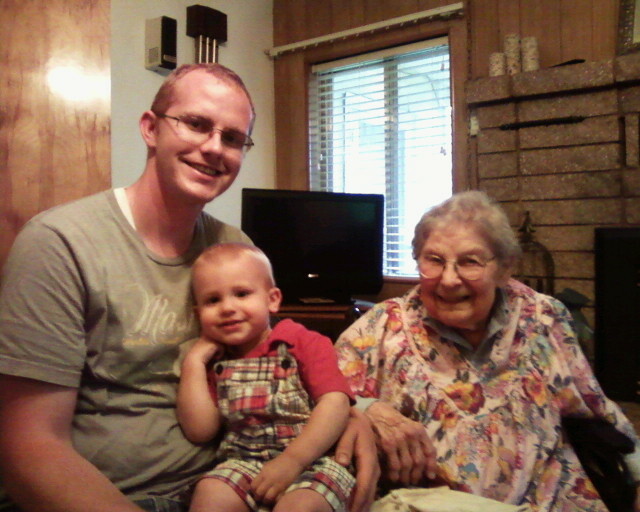 Squire and Lincoln with Great Great Grandma Brinkerhoff. We then spent our last few days in Page visiting Uncle Trace and DeeRae, and Great Grandma and Grandpa Hepworth, and Squire’s Uncle Wayne and his kids. 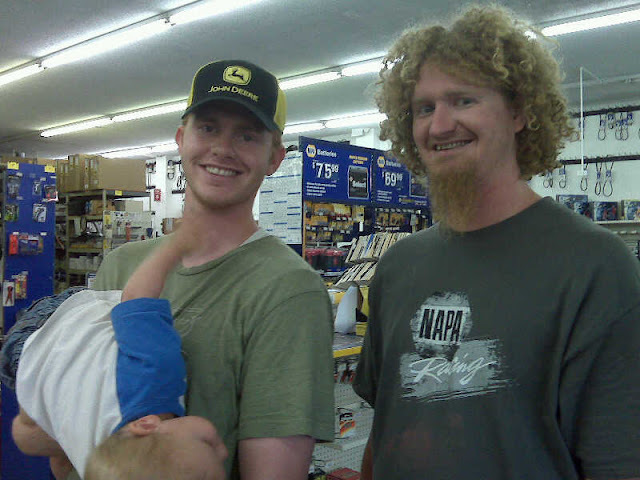 Squire and Brother Trace, with monkey Lincoln. Grandpa offered Squire a job to paint their Living room and dining room while we were still in town. Squire took him up on the offer and worked on that for much of the time we had left in Page. Grandma loved the color and Squire had a nice time visiting with Grandma and Grandpa as he painted. Those Grandparents Hepworth,we just really love them. On Tuesday Grandma Hepworth offered me a gift that will change my life! I’m not even just being dramatic. Grandma Hepworth asked me if I wanted her Bosch bread mixer with blender attachment. “Really?! Are you sure? Are you serious?” pretty much summed up my reaction. I’ve dreamed of owning a Bosch for a long long time – longer than I’ve been married. Squire bought me a hand wheat grinder for my birthday, and also bought an attachment for it to connect to a Bosch motor, hoping that we could power our hand wheat grinder by a Bosch in the future – but being able to afford a luxury item like that was years and years away for us. Grandma said she bought it a few years ago, but had only used it a few times and wanted to give it to someone who would use it a lot. I am so incredibly grateful for her generosity. First off, we don’t even have a blender right now and haven’t for the last year or so – so just having a blender will be great. And, I do make bread or pizza dough about 1-2 times a week as it is – all hand-kneaded, and have done so for the last 4 years. With a Bosch, it will make my bread-making that much more easy, consistent and tasty. And since I have the motor power now, I think I’ll be making the larger part – if not all of our sandwich bread, from home-ground wheat. YUM!! Grandma said that the recipe for the wheat bread in the Bosch handbook is really yummy and really easy. I can’t wait to try it. I will think of her every time I use it. Watching Lincoln run around barefoot in Grandma and Grandpa Hepworth’s backyard and drop apples into the chicken coop. Lincoln couldn’t get enough of those chickens. Visiting with Grandma Hepworth. She is a woman after my own heart. I always enjoy talking with her, and find that hours pass easily whenever we get the chance to talk about big things, small things, and everything in between. Watching Squire’s dad playfully punch Squire in the arm, and then seeing Lincoln turn to Squire’s dad to do the same to him. It became their little inside joke during our time in Page. Lincoln punching Grandpa Hepworth one last time before we left Page. Seeing how much Lincoln loved to wear Grandpa Hepworth’s cowboy hat. He happily wore it around quite a bit. 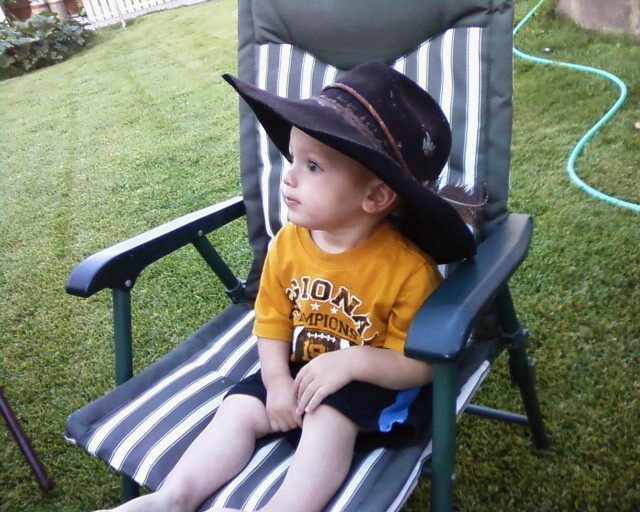 Lincoln wearing Grandpa's cowboy hat. Visiting the Chains to swim again before we left, and hearing the sound of Lincoln’s laughter in the water along with several foreign languages of the tourists who swam nearby. Lincoln learned and really solidified a lot of new words this trip. My favorite though has to be, “Cow.” Which he says with a pretty guttural “c” sound, and with the “ow” very far back in his throat. He calls all cows, horses, oxen (which he saw in a picture), as well as the occasional dog or goat, “Cow?” He asks because he wants to know if he is right. He is so proud of himself when he is. And then, on Thursday we made our trip back down to Tucson. Home. It was a really beautiful and unusual feeling - coming home to our little place, even after visiting places that have been home to us over the course of our lives. We are happy to be back after being uprooted for such a long trip, but even more glad we got to see and visit with so many of our family members along the way. It was one seriously long, and seriously awesome Summer trip. Looks like it was an awesome summer! Lincoln is sooooo cute, Jami :) I can't wait to see your next little baby!